Similar to when the original Impreza debuted in Britain 21 years ago, there are no sporty variants in the range – the recently revealed WRX STI does away with its Impreza badge altogether. Instead, just one trim level, RC, and one engine, a 1.6-litre ‘Boxer’ petrol, will be available, albeit with a choice of five-speed manual and six-speed Lineartronic automatic transmissions. Whichever gearbox you choose though, the Impreza comes as standard with all-wheel drive giving reassurance to motorists who spend a lot of time driving in slippery, hilly conditions. The Subaru’s 1.6-litre Boxer engine is unique in this size of car, the manufacturer claiming its design allows it to be positioned lower in the car, helping promote good handling. Whereas most cars in this class feature engines with four cylinders positioned in a line and pointing vertically, the Subaru’s motor has two cylinders pointing left and two pointing right at 180 degrees to each other. It's what is know as a 'Boxer' engine because the pistons 'punch' backs and forwards horizontally. Producing 112bhp and 150Nm, the latest Impreza isn’t going to encourage high-speed rallying heroics from its driver: top speed is 114mph, while the 0-60mph sprint takes a leisurely 12.3 seconds. Standard stop/start helps boost fuel economy although by rivals’ standards the Impreza is thirsty, a consequence of its permanent all-wheel drive. Manual cars manage 44.1mpg, with the Lineartronic posting a superior 46.3mpg figure. Emissions are rated at 147g/km and 140g/km of CO2, respectively. On sale from May and costing £17,495 for the manual version and £18,995 for the Lineartronic, the Subaru Impreza 1.6 RC is generously equipped with automatic lights and wipers, power-folding door mirrors, 16-inch alloy wheels, dual-zone climate control and heated seats. Subaru promises that the latest Impreza hatchback is more spacious and practical than its predecessor too, citing a windscreen positioned further away from the front seat occupants as one method of gaining interior room. Passengers also sit higher in the Impreza than in other medium-sized family hatchbacks giving a marginally more commanding view of the road ahead. Check back soon then to read Parkers’ detailed new Subaru Impreza review and find out how this intriguing new family hatchback fares. 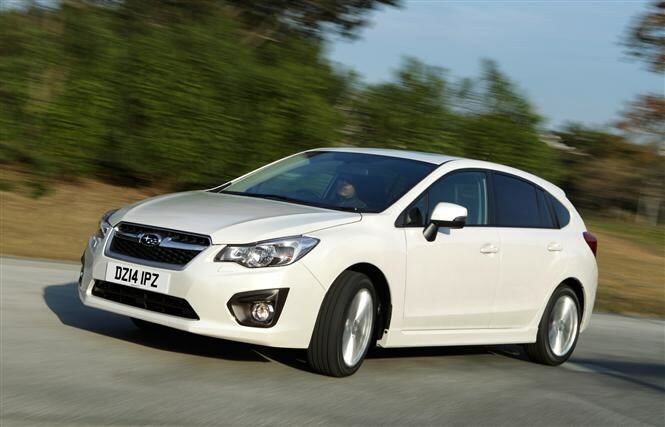 Did you know the most popular review for the Impreza range is the Subaru Impreza Hatchback review.